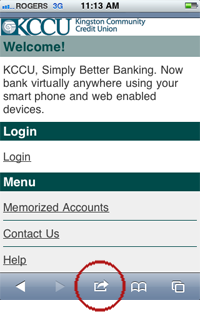 KCCU and MemberDirect® online service now offer the added convenience of being able to access service with your smart phone. It's Blackberry, Android, Windows 7 Phone and iPhone compatible. 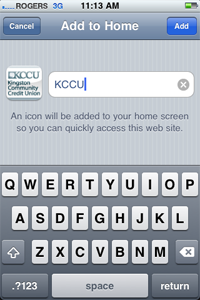 There are two ways to access your KCCU account on your phone or tablet. Login using your online account credentials. 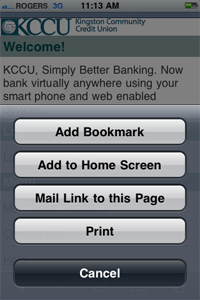 Visit <Smart Phone Log-in> on your Smart Phone or Tablet, press Page Options Icon. Select the "Add to Home Screen" button from the menu. Give your new KCCU icon a name and select"Add"
Select the icon to launch online service and enjoy the convenience of having your account in your pocket or on your tablet.